Well-made. Quality is evident. Feels substantial. Color as pictured. Maybe a bit more on the gray side. But beautiful. I have the King set. There's nothing quite like a comforter set that combines textural details with an elegant look. Revamp the bedroom with this graceful yet stunning bedding set from Madison Park Signature. This Shades of Grey comforter set includes a comforter, standard shams, euro shams and decorative pillows in coordinating hues. Two decorative pillows feature embroidered patterns while another features an overlapping weave pattern. Shop for this bedding set and give the bedroom a crisp, cohesive look. 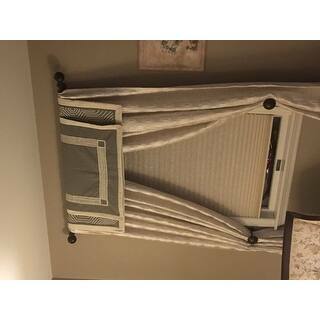 The comforter comes with a removable insert and decorative buttons for a secure fasten. I did a lot of research to choose my next formal bed set and this one sure didn't disappoint! The first thing I want to compliment is how heavy this bedding is. Very well made woven fabric, this is a Duvet and comes with a filler which is very unusual and for it is such a good quality was even more impressive. The color states gray & beige. I would advise that this is gray but what i would call a true "Taupe Gray" verse a slate gray or true silver gray and still stunning. It comes with King & Euro Pillow shame that is just beautifully made. The buttons on the duvet are solid and hold well as well as being reversible to change the look of the bedding to form a solid to a pattern. Again, I can't say enough to compliment how well this bedding is made. I have purchased items for a lot more than the sale I got this for under $250 and nothing like this quality and truly heavy. You could take the filler out and this works well for both the winter and summer I would think. I like weight to my comforter but I could see how some would think this is too heavy. Again, super happy with this purchase! Overstock you havent disappointed yet. I haven't take any photos yet but I hope I can update later. You don't have to buy fillers for throw pillows but you do have to fill the Euro shams and the King Shams. Absolutely beautiful. Ordered this item and was worried about it not being perfect and was happy when I opened the box because the color is just like shown. This has a removable insert which will make it very easy to clean when needed. Cannot wait to paint the room to let the set stand out even more. Had to post a picture so you can see how just pretty it goes with my grey pillows. Also, this set brings a lot of pillows and I have not used them all on the picture shown. Beautiful comforter set. Very plush high quality luxurious looking and feeling. I cant believe the fabulous decorative throw pillows ..there are 3. And 4 more beautiful shams which require a filler pillow. I had matching shams already so i used just the throws and it all looks beyond beautiful! I’m really happy with this purchase. I ended up not using the European Shams for now as I felt there were already enough pillows on the bed. The color is as expected and the comforter is oversized to the point you almost don’t need a bed skirt. It lays on the bed nicely and I like that the comforter is a duvet with a removable insert. I love it! This comforter is super heavy but it seems like it’s good quality material. I imagine it’s too heavy to use for most people. However, I only use comforters for looks I don’t actually cover up with them. The color is more of a taupe to me than gray. It looks just like the picture. Seems like it will last a long time. This set a a even better than the photos! High quality fabric and love the decorative pillows! Highly recommend! This is a beautiful comforter set. The colors are design are very nice. Big fluffy comforter, light weight insert but very warm. I looovvvveeeee all the pillow cases and pillows that came w this set. U never get all the pillows in the add but this one u did. We love it. Got lots of compliments!!!! I was pleasantly surprised of how well made this Comforter Set is. 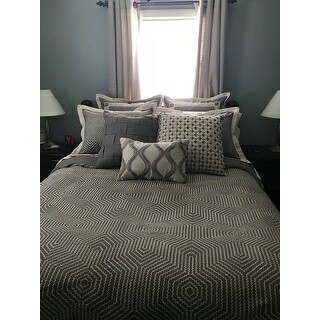 It looks awesome on my bed and I didn't realize that there were 2 different sets of shams along with the other 3 pillows. We can't use it at night since it is very heavy and warm but I guess I could take out the insert, but it won't look as good as a coverlet. This was well beyond the price I paid. I would have expected to pay at least double the price for the quality. It seems to be more of a warm taupe grey/brown, but I knew that going in. It's perfect! I love this set! It is very well made, looks gorgeous on our dark wood bed. 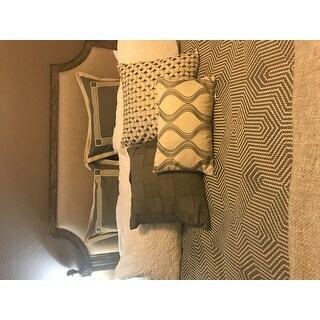 I thought perhaps I would need a few more decorative pillows but the three that accompany the comforter set are perfect. I recommend this set to everyone. Get lots of compliments! I absolutely LOVE this bed set! Pictures online show the colors perfectly & I love the weight of the blanket. The quality is very nice & luxurious. The threading is well done & the comforter does not wrinkle easily. I purchased the Ashley Williams extra firm square euro pilllows to fit into the larger pilllow case & they are also perfect! If your looking for a bed skirt in asdition to this set I ordered one in cream color off of Amazon since I needed one that would fit an adjustable bed frame. After hours of searching I found a bedskirt that wraps around the bed base & has additional pieces that Velcro around the sides...works perfectly! We also paired this with white sheets & an ivory coverlet also purchased on Overstock! All came together beautifully!! We love this bedding. I wish the comforter didn’t move inside but great quality and really pretty!! Very beautiful and very comfortable. The grey is more of a darker/charcoal, but still very very nice. So far, a good purchase. Update: We've had this bedding for about 10 months now and I still love the design and look of the bedding set. My only complaint is how heavy the comforter is. It is so heavy that my husband has started complaining about how his feet hurt when we sleeps on his back due to the pressure from the comforter. I am going to start searching for a lighter duvet insert, or possibly just take the insert out all together. I don't want to replace it because it is so beautiful and exactly what I want, but I have to agree with him, it has become too heavy to sleep comfortably. And turns the bed into an oven. Love the look of this set! Very soft , heavy, and very good quality! I only gave 4 stars because I haven’t had it a year yet and the comforter is starting to look a little fuzzy but probably because our dog likes to lay on the bed when we aren’t home! I love it, looks just at beautiful in person. This set is beautiful and just what I wanted. It is gray, but the accent color is a cream that gives the gray a "greige" feel. I have cream colored walls and a red leather chair in the room. All ties together nicely. The quality if terrific, too. If I had a complaint it would be that the stuffing of the comforter is unattached to the lining. It takes a little work to get it just right. Other than that it is perfect. I like that this set is very neutral, we had dark blue carpet put in and I was looking for something gold or grey with a pattern, unfortunately it is really hard to find a nice gold comforter set with pattern, I did not want the room to appear to minimalist but also at the same time something neutral enough - somewhat masculine but also patterned and this fit that, love all the pillows it came with as well. Great patterns. This set is lovely! The colors are very subtle and elegant. Excellent quality. Was even nicer than I’d hoped for! The quality is very good! Made very well! 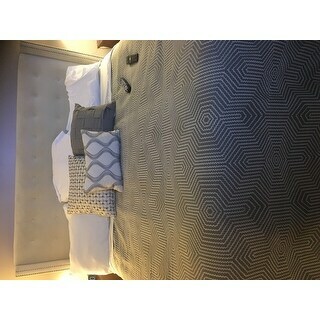 Beautiful bed set.... the quality is awesome! This a my most favorite comforter set ever. My husband and I spent 2 years trying to agree on a pattern that was not too feminine, nor too masculine. This is the perfect set, very well made. Classy, yet comfortable. Love it! This is a beautiful set. For the money, it would be impossible to get the quality of all the times in this set. It looks more taupe on the photos but it really is a grey in person. Its a very contemporary/transitional set that comes off very classy and mature. "I wish this was more on the brown/beige/taupe color scheme than a true grey. The pictures don’t seem grey to me. " This item is a shade of grey. "I am interested in the two paintings in the photo?? Does overstock sell them or where could I find!?" "I believe someone already asked this but it failed to be answered. Headboard? Do you sell the headboard in the pic?" Unfortunately no, the headboard is not for sale. "Confused- conflicting answers above. Is it gray or taupe. It looks more taupe but says it’s gray except one answer said taupe as well - which is it?" "Is this truly grey? I have read one review that says it is and another that says it's more of a taupe. Please clarify. I am looking for more taupe." The tones are grey however combined with ivory and browns the tone appears to be a subtle shade of taupe. 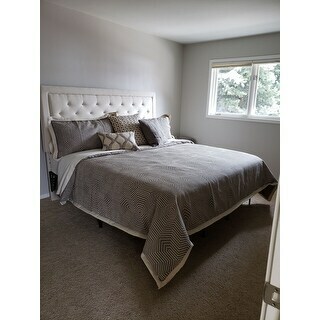 "Is the color in this comforter a true cool gray or is it more warm "greige" (beige/brown grayish) color?" It is a true gray. It is a beautiful comforter, great quality! It is a more of warm "greyish" (beige/brown grayish) color! "Can this be used as a duvet cover with my own down insert? Or, is that what it is, and it just comes with its own insert? " Comes with insert, but you can remove and add your own. Has button closure on the bottom. Good quality duvet.